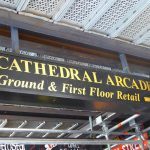 You could easily walk right past Cathedral Arcade without realising it’s there, especially in 2018 when there is scaffolding up and building work for the next few years as they dig deep to create the new Metro Tunnel in Melbourne. You’d be missing a treat, though. 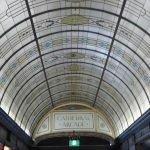 Melbourne’s Cathedral Arcade still has the original 1920s lead lighting glass ceiling all along the L-shape of the arcade between Swanston Street and Flinders Lane, and especially the fantastic domed ceiling in the corner of the L by the vintage clothes shop. This is magical and spell-binding. 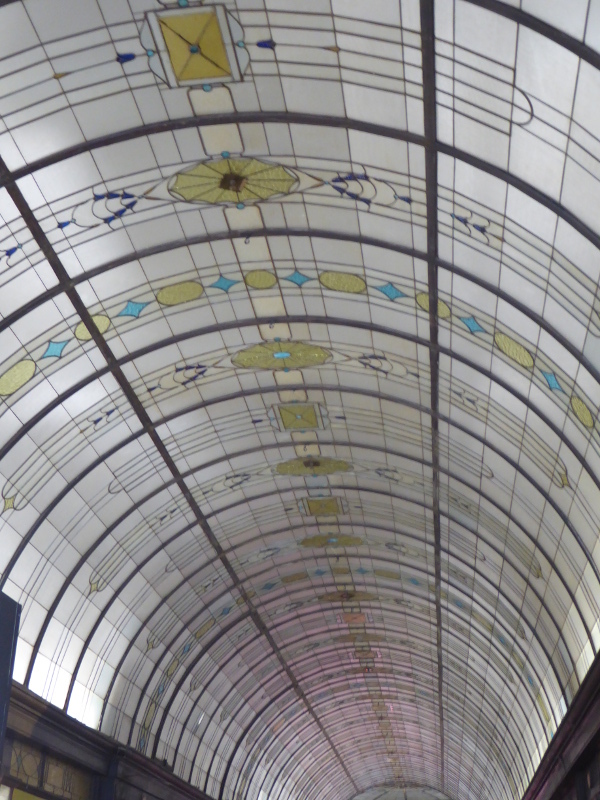 This arcade may not have the glitz and glamour of its neighbours the Royal and Block arcades, but it has style. 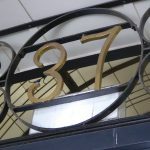 As well as the decorated glass ceiling, there are the ornate iron numbers above both entrances, a wonderful vintage letter box tucked away in the wall opposite the coffee shop (which is also a great find by the way), and beautiful old lifts still taking people up not only to the second level of the official ‘arcade’, but also up to the other floors of the Nicholas Building. 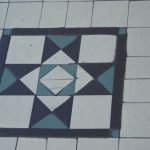 There is a brief history of the building along 10 metres of wall inside the arcade, with much praise for the architect at the time as well as the original owners of the building – the latter were the Nicholas brothers ,George and Alfred, who made a fortune in aspirin, of all things. 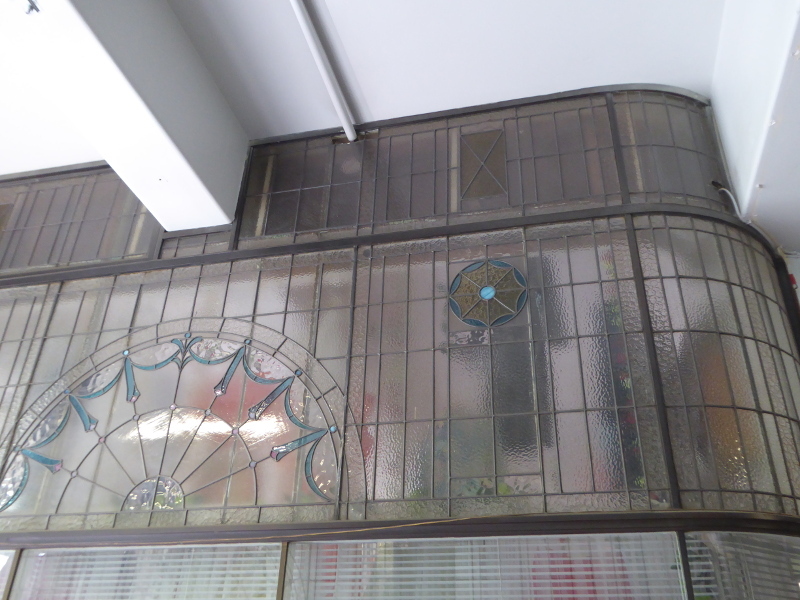 Check out the upper level of the arcade too for more beautiful shop fronts, and let your imagination flow at what shop you might like to run in one of the three or four vacant spots on this upper level. 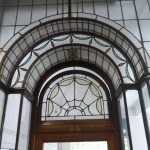 You’ll have fantastic windows and curved frontage to your premises, and a daily ride up the creaky old lifts (unless you want to take the staircase of course). 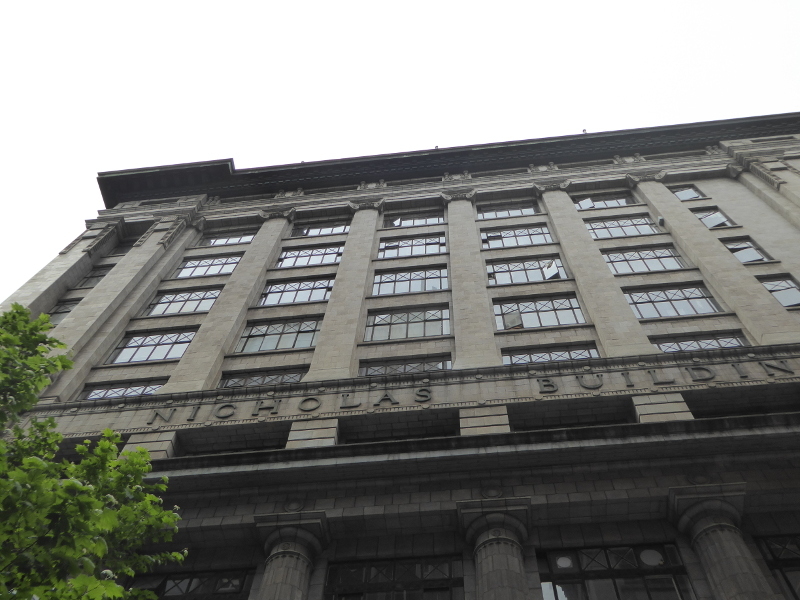 When this building opened in 1926 there was great fanfare not only about the terracotta façade, which was supposed to ‘always look new’ according to the architect, but also about the whole Nicholas Building being in stark contrast to the ‘sombreness of the cathedral’ itself. 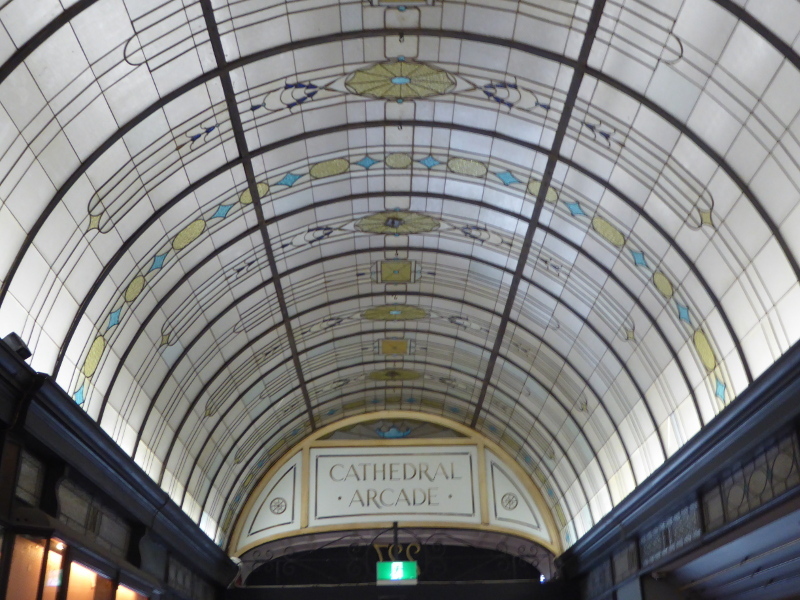 It was an editorial in The Herald in March 1926 which described the cathedral in that way, so I had to take a look outside the arcade to check on whether the contrast was still apparent in 2018. 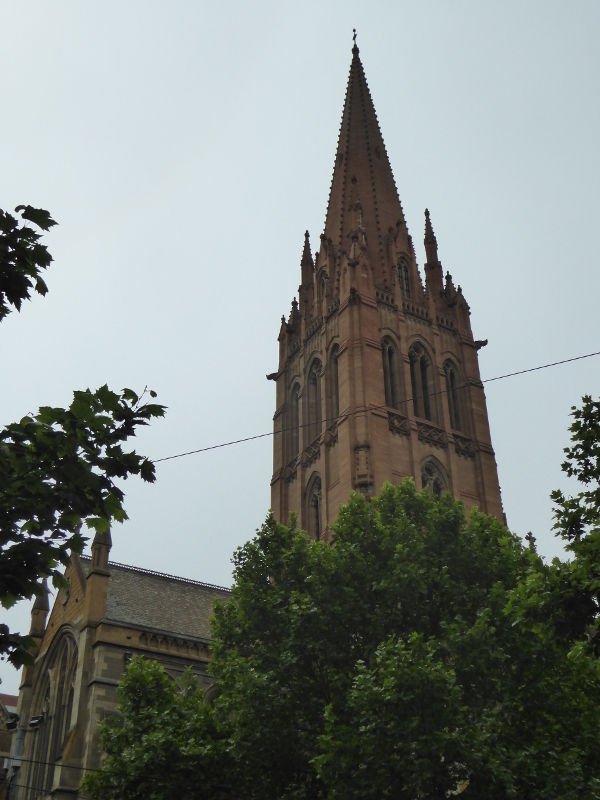 With all the scaffolding and rather modern frontages along Swanston Street now, the roles actually feel rather reversed, in my view, with the cathedral now looking rather splendid and bright just across the road from the arcade. But maybe the writer was thinking also of the ‘sombre’ atmosphere around a cathedral all those decades ago. So you do need to be inside the Cathedral Arcade to appreciate its beauty today. And I was thrilled to find it. The coffee is excellent at Cathedral Coffee (more on that below), there are interesting shops on the ground floor, with a vintage clothes store adding to the bohemian feel, and upstairs a lovely book shop and more vintage clothes. With tarot readings and reiki on offer upstairs also, the Cathedral Arcade met my love of the quirky and bohemian shops that so often make arcades so fascinating. But I was slightly disappointed not to find some of those shops that used to be here back on opening day 1926, including the barbers, the drapers, the florist and the shoe shops. 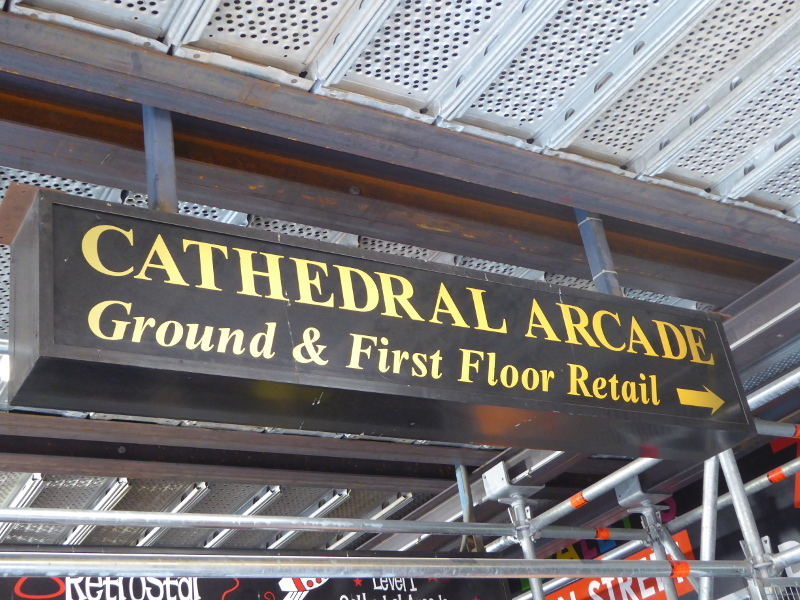 They’ve done a pretty good job, though, in finding tenants that keep the history and traditions of the Cathedral Arcade going 90+ years on (just one big corporate company occupies one of the shops on the ground floor). 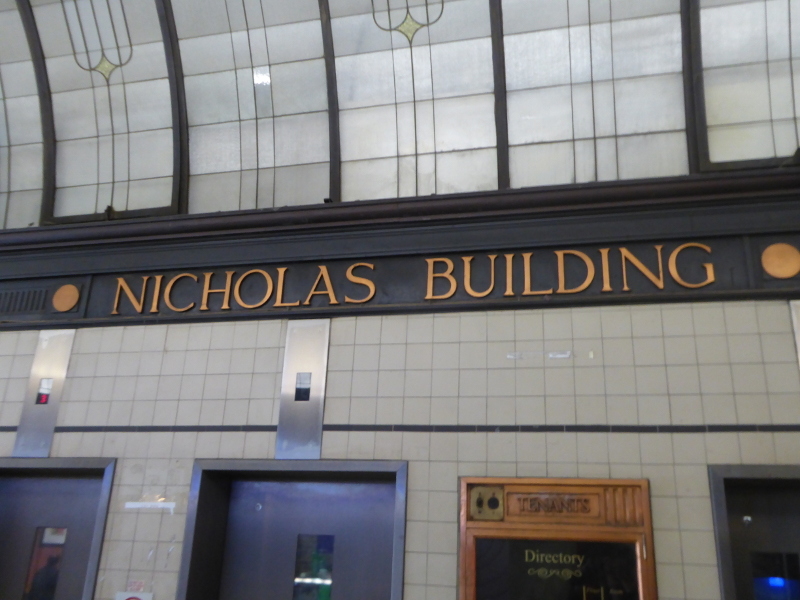 I also loved looking through the occupants of some of the upper floors of the Nicholas Building, where there are milliners (if not drapers), and a powder room and eye lash salon (I didn’t go and check what they do…) instead of the men’s and ladies’ hair salons of 1926. 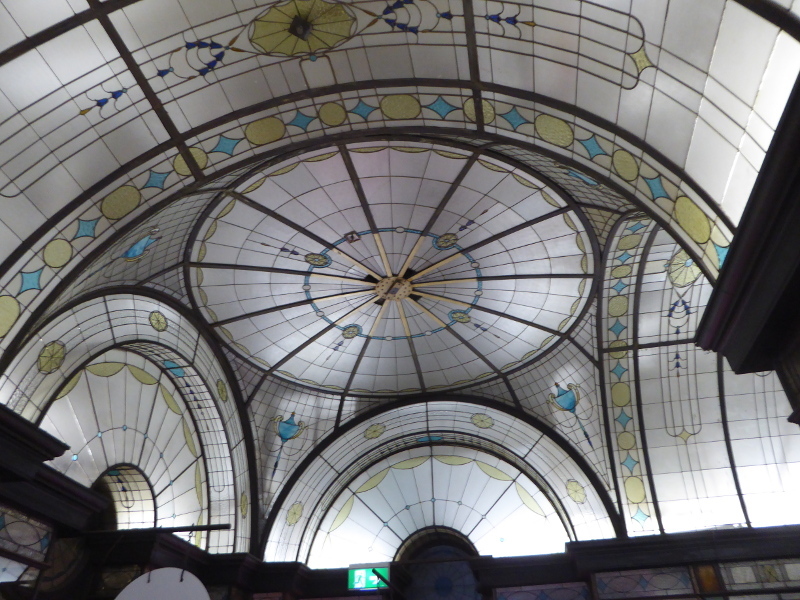 It was also nice to see so many bookish people here, both in the arcade itself with that bookshop upstairs, and higher up the building with The Stella Prize for women’s literature having an office here. 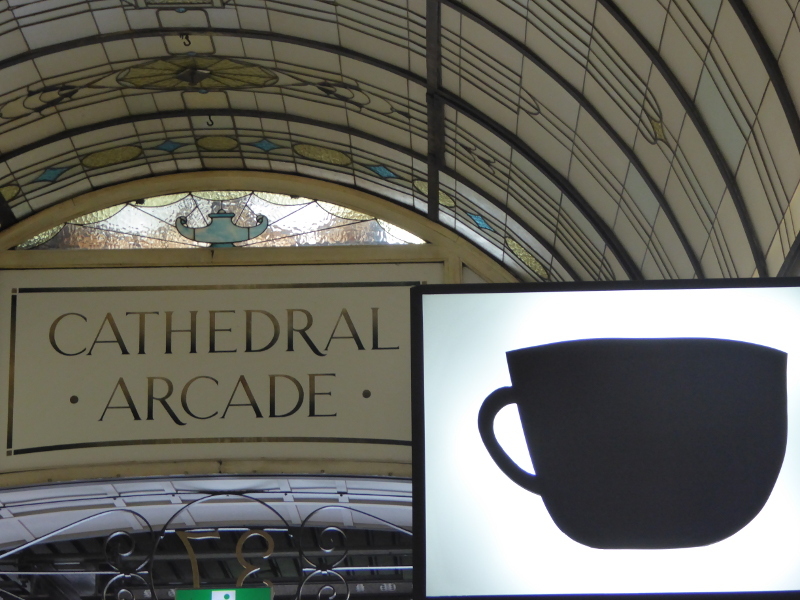 I loved the Cathedral Arcade. 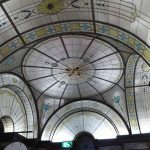 That ceiling means it’s a place to keep looking up rather than down (though the floor tiling is quite nice also – are those tiles the original Delf tiles The Herald spoke of back in 1926? I’m no expert I’m afraid, so wouldn’t know… Comment below if you know…). 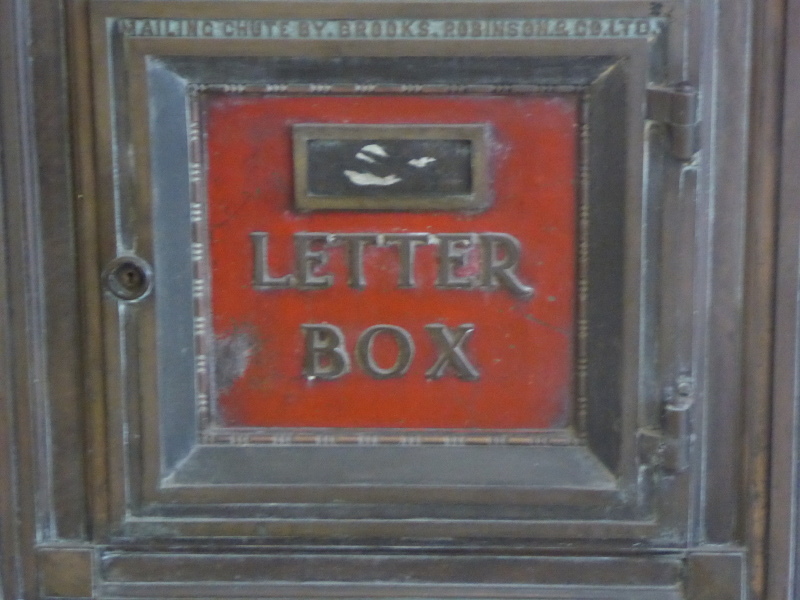 So just sit and have coffee in the arcade, where you can gaze at the glass, observe the ornate ironwork and spot that old letter box across the way. Take the stairs or the lift to reach the first floor, which is still part of the Cathedral Arcade and where, as well as a good bookshop, there are a couple of empty shops (at the time of writing in late 2018). A stone’s throw from Flinders Street station, Federation Square and of course right across the road from the Cathedral. There are no public toilets in the arcade. The L shaped arcade was to have white as its main colour, with blue and amber decorations. 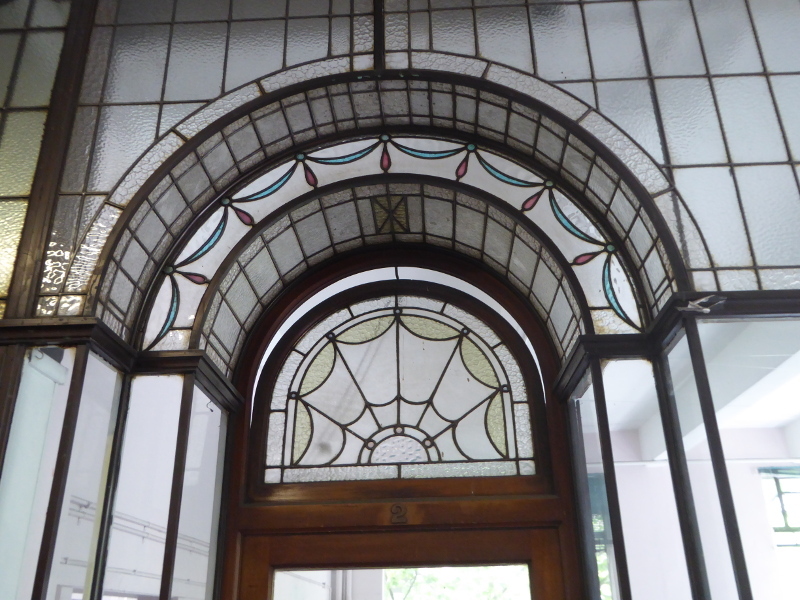 I think the white may have gone (unless they meant the tiling on the floors), but the blue and amber are still visible in the lead light windows, and maybe the ‘white’ is the colour they mean for the rest of the ceiling glass? Delf Tiles were installed last so that the heavy lift equipment would not cause any damage, but it was the lifts which were perhaps the most celebrated aspect of the building. I loved the discussion of lift speeds, noting that these new lifts up from Cathedral Arcade could reach speeds of 600 feet per minute, even though Melbourne by-laws specified 300 feet per minute as the maximum. 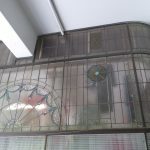 I have no notion of just how slow that is compared to modern day lifts, but I know the building owners were lobbying hard for the lifts to be allowed to reach their full speed! 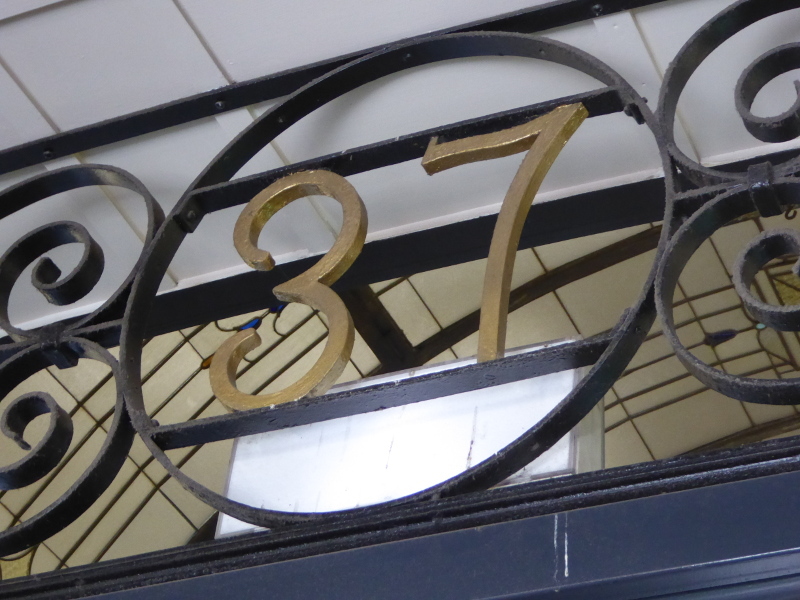 In 1929 the Housewives Association opened a Frock Shop in the Cathedral Arcade – inside you could join the Association for the princely sum of 2/- (about 20c). The court case went on for weeks after the gangsters (called ‘bandits’ in the language of the day) were arrested. 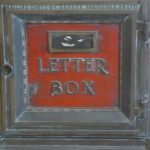 And it was fascinating to see how lawyers for the defendants tried to dismiss evidence from police officers on the scene who had been distracted by watching ‘the lifeless head of some curly beauty in a ladies toilet rooms’ in the arcade…. 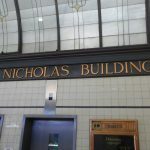 The whole Nicholas Building has its own blog. 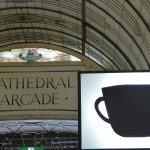 What are your stories and memories of the Cathedral Arcade? 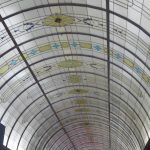 Does anybody have their own memories of Cathedral Arcade or want to share a recent experience in the arcade? 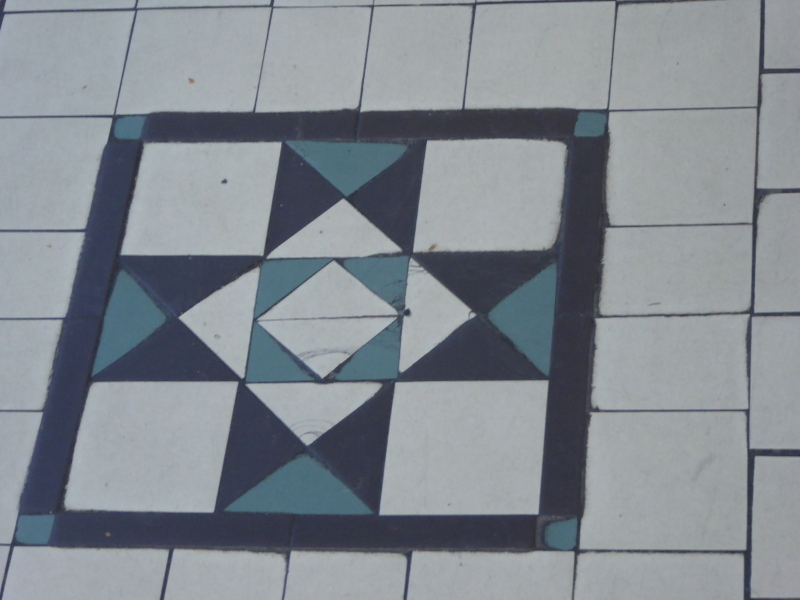 Sit and admire the ceiling, the art deco signage of the arcade, the vintage letter box across the way from the coffee shop, the tiling on the floor of course, and just people watch. Great coffee too, roasted in nearby Collingwood.